The life of an Epson inkjet cartridge is determined by the printer. When the printer calculates that the cartridge is empty, it informs the chip on the cartridge it is empty. That is that! How can extra ink be obtained? The ink status monitor shows how much ink is contained in the cartridges. The status monitor updates itself during printing via information being passed to it from the chips on the cartridges. 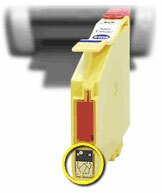 A cartridge’s print life usually ends when the status monitor believes the cartridge to be empty, and the 'empty' cartridge must be replaced in order for printing to continue. However, Jet Tec Extralife cartridges use "smart" chip technology: When enabled, the chip's patented program activates the Extralife and displays it in the "status monitor"*, thus allowing access to extra ink from the Jet Tec cartridge. NO OTHER CARTRIDGE RANGE DOES THIS. *Some Extralife cartridges may not display Extralife in the status monitor. Extra ink alone does not mean extra pages..! Jet Tec's patented extralife system has been independently verified and is the only extralife system in the world. Other ink cartridge distributors and resellers claim that they have tested and proven that their cartridges print up to 30% more. Unless the chip is reset, the cartridge will not print any more pages than the Epson Original. Our technology is proven, with many products tested and approved by the LGA and further verified by winning the "Queen's Award for Enterprise: Innovation." Releasing the extralife is very straight forward please click here for more information. Extralife also means good news for the environment: As our cartridges last longer, fewer Jet Tec cartridges are thrown away than other brands.